Desarrollado sobre la base de la IS-7 por las Oficinas de Diseño de las Plantas de Kirov en Leningrado y Chelyabinsk. El desarrollo comenzó en 1947, pero fue suspendido en la fase de diseño. Rather than using the 203mm gun from the the 212A, it mounts the 180mm which may turn some people off with its lack of damage. It does compensate with a higher rate of fire, and has good accuracy which makes some players use Armor Piercing shells for more consistent damage and better penetration. Unfortunately, it only carries 18 rounds as opposed to 40 rounds on the 212A. It is quite mobile for its size, having the second highest top speed of the four tier 10 SPGs. Most accurate artillery in the game. High penetration AP rounds - 360 mm pen, and loses only 10 mm on long distance. Artillery is fairly mobile, being only slightly slower than many mediums. Experienced players will quickly note that the Object 261 can't hit heavily armored tanks and some TD's. This is not because of the penetration or damage, but because of the angle at which the shells reach their targets. Most SPG's have low penetration, but since shells tend to hit the lightly-armored top of tanks, damage increases. With this SPG, shells will hit the heavily-armored front, or at a near-parallel angle to the top. Therefore, this SPG should be used to attack mediums, and not well-armored tanks. Counter-battery is a death sentence to this SPG, and since the gun elevation restricts it from countering, relocation is key. 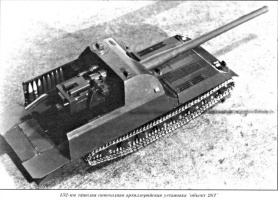 Developed on the chassis of the IS-7 by the design bureaus of the Kirov Plants in Chelyabinsk and Leningrad, development started in 1947, but was suspended during the design phase.